Are you jonesing for a getaway but deterred by this cost? This may ring especially true for people with children. So what should you do if you want to scratch that travel itch without breaking the bank? Explore some of the beautiful and diverse cities right here in the United States! Read on for our picks for the most affordable travel destinations in the U.S. in 2017. Looking to earn travel rewards? Find the best travel credit cards. To find the country's most affordable travel destinations for a family of four and for individual travelers, we considered four factors: average cost of round-trip airfare, average hotel rates, average daily car rental rates and the average cost of restaurant meals. Using data on these factors, we calculated the average cost of traveling to the 48 largest cities in the country for a three-day and three-night trip. Cities that rank high on affordability for a family of four might not rank as high (or might even rank higher) for an individual because the four factors weigh differently for each type of traveler. If you're a family of four on a budget, expensive flight tickets would impact your total cost differently than if you are an individual who only has to buy one ticket. You can read more about our full methodology below. The Sunshine State wins again – The most affordable travel destination is Orlando, Florida for the second year in a row. Two of this year's top three cities and three of the top 10 are in Florida. No state has more cities than Florida ranking in the top 10 or top 20. The Northeast is still expensive – New York City was the most expensive travel destination of the 48 cities we studied. Boston, Washington D.C. and Philadelphia were all within the six most expensive cities. This is SmartAsset's third annual study of the most affordable travel destinations in America. Read the 2016 version of this study here. 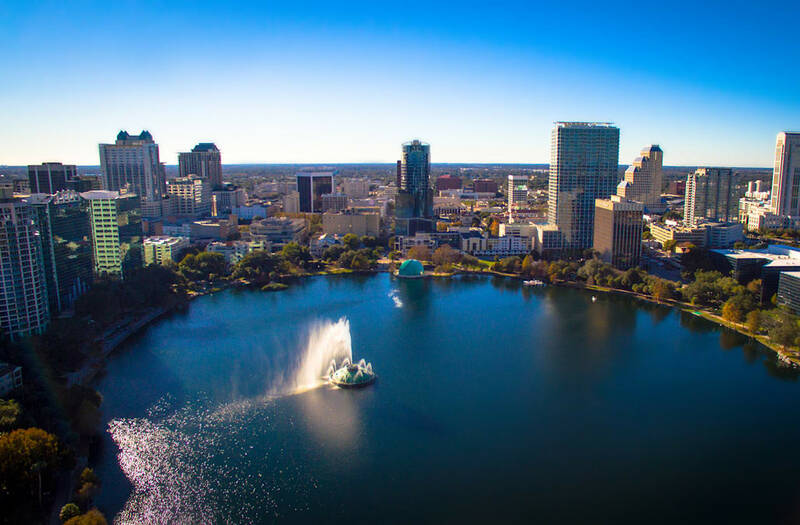 For the second year in a row, Orlando is our most affordable travel destination for both individuals and families. A single traveler can expect to pay about $800.04 on average. A family of four can expect to pay $2,283.85. It helps that round-trip plane tickets to Orlando are 8.3% cheaper than in 2016. That’s the second-largest price decrease in our top 10. The biggest draw to Orlando is likely the theme parks. Orlando is, after all, “The Theme Park Capital of the World”. However, there are a lot of other things for families to do, as well. At the Orlando Science Center you can see dinosaur fossils in the morning and then stargaze in the Crosby Observatory at night. Looking for nature? Check out the Leu Gardens, a 50-acre botanical sanctuary. Orlando also has a number of well-kept golf courses for everyone from the casual player to the serious PGA fan. Las Vegas moves up one spot from 2016 to claim number two in this year’s study. One big factor in this move is that an average round-trip flight ticket costs only $223.49. This is the lowest cost to any major U.S. city in our study. There’s more to Sin City than casinos. Downtown Las Vegas serves as a hub for arts and culture. There are great shows, concerts, food and entertainment options. Listen to the Las Vegas Philharmonic at the Smith Center for the Performing Arts. Visit the Las Vegas Natural History Museum to learn about rainforests, dinosaurs and ancient Egypt. Or you can stop by the Mob Museum to look back at organized crime’s unique impact on Las Vegas. With its highest ranking since we started this study in 2015, Fort Lauderdale is the third-most affordable travel destination for a family of four in 2017. At $240.85, Fort Lauderdale has the second-lowest average flight ticket cost behind only Las Vegas. Flight ticket costs play a big part in affordability for a family of four and helped Fort Lauderdale rank so high. Fort Lauderdale is one of the most popular tourist destinations in the U.S. and it’s easy to see why. There’s near constant sun and temperatures above 65 degrees Fahrenheit almost all year. You can have some fun at the beaches or take a gondola ride through the city’s canalways. Fort Lauderdale also is a major yachting destination in the U.S. and features one of the world’s largest annual boat shows. Phoenix, Arizona continues its rise. After finishing 10th in 2015 and eighth in 2016, Phoenix ranks as the fourth-most affordable destination for a family of four (and also an individual traveler) in 2017. Phoenix has the fifth-lowest hotel rate in our study at $113.58 and the ninth-lowest average restaurant meal cost at $25. Downtown Phoenix is home to a lot of performing arts so whether you’re looking for theater, opera, ballet or films, you’ll probably find something that strikes your fancy. Phoenix also has the largest municipal park system in the country, with over 41,900 acres of city parks. You can find plentiful hiking, camping, swimming and climbing. Take the family down to the Desert Botanical Garden and the Phoenix Zoo. Certain nights between November and January, both of these venues illuminate thousands of lights for shows and festivals. One county over from Phoenix is Tucson. Round-trip airfare to Tucson is relatively high at $384.06. However once you get there, you’ll find the third-lowest average hotel room cost in our study ($101.95). Tucson is also tied (with San Antonio, Texas) for the lowest average restaurant meal cost at just $20. Tucson is a great place for people who love sunny days and high temperatures. Bicyclists can ride down the Tucson Loop Bike Path for over 100 miles of shared-use paths. And family fun can be found at the Pima County Fair. It runs for 11 days in April and features live animal shows, concerts and carnival rides. Reno, Nevada took a small drop from 2016 and comes in at sixth in this year’s travel affordability ranking. A big reason for the tumble is a 13.68% increase in the average hotel room cost. Although, at $100.46 per night, Reno still has the second-cheapest hotel rates in our study. Like Las Vegas, Reno has a number of casinos where visitors can test their luck. The city also offers opportunities for biking, camping, hunting, fishing and mountain climbing. The Wilbur D. May Arboretum and Botanical Garden covers 12 acres and is free to the public. Fans of performing arts can watch theater productions at the Pioneer Center for the Performing Arts. There is also the Nevada Opera and the Reno Philharmonic Orchestra to go see. And the National Automobile Museum is consistently voted one of the top automobile museums in the nation. Albuquerque, New Mexico stays in the top 10 for the third straight year and is the seventh-most affordable travel destination for families in 2017. One reason Albuquerque ranks well is because at just $92.35, it has the lowest nightly hotel rate in our study. The average restaurant meal is $23.75, eighth-lowest in our study. Biking and hiking trails abound in Albuquerque whether you’re looking for a casual stroll or a serious day excursion. Visitors can try birding and there are green golf courses throughout the city. If you’re looking for stunning vistas, you can ride the Sandia Peak Aerial Tramway to the 10,378-foot peak of the Sandia Mountains. There you take in a panorama of more than 11,000 square miles. Kids will enjoy the city’s botanical gardens, museums and aquariums. Kansas City, Missouri claims the title of this year’s biggest mover. It climbed nine spots to become the eighth-most affordable travel destination for families. Part of the reason for the climb is that round-trip flights cost only $345.35 on average. That’s a 4.67% decrease from 2016 and Kansas City also has the third-lowest restaurant meal cost ($21.75 per meal) in our study. Kansas City is also affordable due to its high number of free sites and activities. Hitch a ride on the 2.2-mile KC streetcar line to discover the city’s vibrant downtown. Bring your hiking gear down to a number of parks and nature sanctuaries. Looking for art? Take part in First Fridays, one of the nation’s largest, free art crawls. Looking to expand your U.S. knowledge? You can also visit a number of museums, many of them free. Jacksonville, Florida is the ninth-most affordable destination for a family of four in 2017. This is the third straight year that Jacksonville has come in ninth. Flights to Jacksonville cost a bit more than some other cities but once you get there, the nightly hotel rate of $103.60 is the fourth-lowest in our study. Restaurant meals cost $25 on average. That’s the ninth-lowest amount in our study. Jacksonville is great for a summer getaway thanks to its sunny climate and beautiful beaches. Paddleboard in the Atlantic, go fishing at the Jacksonville Beach Fishing Pier or catch a wave on your surfboard. Rent a snorkel or scuba gear so you can check out Blackmar’s Reef, which features an abundance of marine life. Jacksonville also has a number of city, state and national parks to explore. Kayak through the city’s nature-filled waterways or stroll through Jacksonville’s arboretum and gardens. Milwaukee, Wisconsin rose six spots to become the 10th-most affordable destination for a family in 2017. The average round-trip plane ticket to Milwaukee costs $326.53. That’s fifth-lowest in our top 10 and represents more than a 8.3% price decrease from last year. At an affordable average price of $25 per meal, you’ll want to explore Milwaukee’s diverse food scene. And don’t forget that Wisconsin is “America’s Dairyland”. You’d be well-advised to look for artisanal cheeses and chocolates. Bike riders will enjoy the city’s 130+ miles of bike trails. Golfers can hit the links at one of Milwaukee’s 15 golf courses. The curious traveler should investigate the city’s dozens of theaters and museums. And kids will enjoy the Discovery Center’s fascinating exhibits on science and technology. Eight of the 10 cities that ranked as the most affordable travel destinations for families of four also ranked as affordable for individual travelers: Orlando, Las Vegas, Fort Lauderdale, Phoenix, Tucson, Reno, Jacksonville and Albuquerque. Tampa, Florida ranks as the ninth-most affordable destination for individual travelers. It just barely missed the top 10 for families, coming in at 11th this year. You can get a nightly hotel room in Tamps for only $128.91, on average. You can also get a rental car for just $30 per day, fourth-lowest in our study. You'll want to use that car, too, because there is a lot to do around Tampa. There is diverse local cuisine and a growing number of craft breweries. Individuals who want to hit the town at night won't be disappointed with Tampa's numerous bars and clubs. Of course, don't forget to dip your toes in the warm waters of the beautiful beaches. Salt Lake City climbed three spots from 2016 to rank as the 10th-most affordable travel destination for individuals in 2017. One factor behind that rise is the eighth-lowest average nightly hotel rate in our study at $121.69. Restaurant meals average just $25, fifth-lowest in our study. But round-trip airfare is relatively high and since a family of four buys more flight tickets than an individual, Salt Lake City ranks slightly lower (13th) for a family of four this year. Skiers can hit the slopes at one of Salt Lake City's beautiful ski resorts. The city offers the Super Pass, which could save you hundreds of dollars on equipment and passes at Salt Lake City's four major resorts. Art fans should head downtown for a number of galleries, music venues and classic movie theaters. Salt Lake City is home to a thriving performing arts scene. The Capitol Theater in particular hosts many traveling Broadway and off-Broadway performances. Families will enjoy attractions like the Hogle Zoo and the Natural History Museum of Utah.